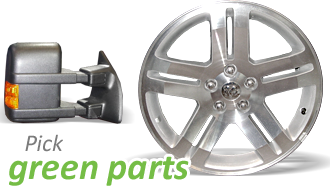 We sell	new and used auto parts. We buy vehicles for parts, as well as cores, starters, alternators, AC. We buy and sell	used vehicles. We have a public scale and buy scrap metal. Located in Ste-Anne-des-Lacs near St-Jerome (Laurentides), we opened for business on August 24, 1998 with 1 employee. We now employ 15 people full time and dismantle nearly 2000 vehicles per year, in the respect of the environment. We are a family business and made our success with good parts and an honest service for our clientele. Proud owners of a Clé Verte environmental certification. Our final grade of 93.4% places us in the Silver category. We are the 2nd recycling center in Quebec to receive our environmental autorisation from the Ministère de l'Environnement. We are also waiting on a Clé Verte certification. We are ARPAC members and Mr. Steve Lemm is on the administrative comittee as V.P. We are accredited with CAREC, the Canadian Auto Recyclers' Environmental Code.